Eight Lives is a riveting medico/thriller which ‘has its origins in’ the trial of a new drug (a real human trial of the drug TGN1412). Told from the points-of-view of eight characters (first person perspective), the respective stories occasionally flashback in time. David Tran is a Vietnamese refugee who has worked hard and become the golden boy of Australian medicine and developer of a new wonder drug. Hurley is a health economist and writer, so the medical details sprinkled throughout the novel ring with authenticity. It was intriguing to learn the ins and outs of how drug trials are conducted and, coupled with clever plot twists and turns, Eight Lives is a page-turner. The only character I didn’t engage with was David’s childhood friend Miles who I found astoundingly naive for a doctor. However, the other characters: David’s violent and seedy step-father, his trusted sister and loving mother were well drawn and believable. I particularly liked the character of Rosa, a research assistant who is given a second chance by David Tran to complete her PHD. Several threads in the story kept me captivated, eager to discover the fates of David Tran’s friends, colleagues and investors. We learn early on in the novel that David Tran is dead, but not much more can be revealed without spoiling the plot. The ending is a surprise – something I certainly didn’t expect but a situation Hurley cleverly foreshadowed. For a debut novel Susan Hurley gets my tick of approval, and I will certainly be seeking out any future novels by this author. I love to discover new things as I read, and there were plenty of ‘I didn’t know that moments’ in Eight Lives. For someone whose doesn’t naturally lean towards science or technology, I was surprised and delighted to find the novel more than held my attention to the end. 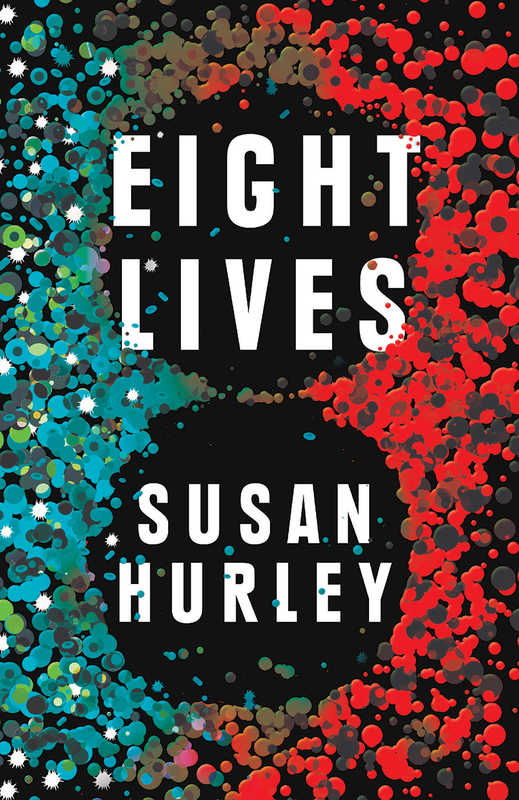 Eight Lives is not your usual crime novel and after turning the last page any altruism I may have possessed for humanity’s physical welfare vanished. I promised myself never to volunteer nor allow family or friends to sign up for a drug trial.